So mom used to curse me with "When you grow up, I hope you have kids JUST LIKE YOU" - pretty standard mom stuff. I barfed in every new car my father purchased. Always less than 2 weeks after purchase. The poor man did not have a new car between 1964 and 1985 that retained a barf-less "new car smell" for over 2 weeks. Do the math. I came home from college to barf in his new car! So, this weekend, poor Tarzan has been sick. When I picked him up at Scribbles, Friday afternoon, his nose was full, it was obvious, we were stayin home caring for a sick kiddo. Saturday he was so plugged up he did not want to drink, it was hard to breathe. He started running a fever. Today, he woke up sickly, in a sour mood, and napped all day. He was even pulling at his ears. It was really the first time he has been so sick he did not want to drink (more than usual) We've spent the entire weekend getting him to take sips of pedialyte at any opportunity. At 8pm, he seemed to clear up some, and drank 2oz formula. He even smiled. At 8:30 he was asleep. Sara put him down in the computer room, and I was gonna sleep with him to let her get a good night. he woke up around 9 and was thirsty. 2 more oz formula, then I went for some pedialyte, it is easier to digest, but he did not want anymore. At 10:30, he started coughing and woke himself up. There is a certain look he gets, that says" get ready to see the contents of my belly!" So I held him upright, got him to lift his arms, just in case we could avoid the barfing. We could not. His eyes water a little, he looks right into my eyes, then his mouth does this quivering thing, and I know. turn him into my chest, man up, and take one for the team. There is no way to describe the awful sensation of hot steamy barf shooting all over your chest. The emotions are mixed, your baby is sick, looking at you with weepy eyes, spewing noxious puke, you feel it burn your skin a little, as you run to the bathroom hoping to catch all the drips, you are tired, exhausted, and hoping the cleanup will not be too hard. Tonight was extra special. Down the neck of my shirt, all in my chest hair, then up my neck, into my beard, nose and eyes. Mucous, formula, carrots, tylenol, bile. Ack! We got to the bathroom, no drips, I did not have to clean my bedsheets, carpet, or anything other than clothes we had on. I came back, and clean the bathroom. Some citrus blend household cleanser and a rag, the bathroom is back to clean, but all I smell is barf. It went up my nose. I must shower. 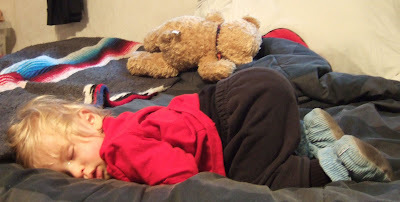 By the time I am out, she has him dressed, and in the master bed, snoozing again. Mom, Dad, you are right, I have a kid just like me, and I'll smell barf for the next few years. Chewable vitamin C - crush it up and pour it into 8 or 12 oz of water (or into the pedialyte) and let him drink/sip it all day long. When he finishes one cup, make another. That's what I give my kids to anti-histamine them. Mine get 500 mg in a half-liter of water or 1000 mg in 3/4-liter of water. You have described the decision process better than I ever could. What always amazed me is how we can be woken up out of a dead sleep and still within seconds make that decision. Barf-o-Rama!